On 28 November 2018, Victor Cherepov took part in the B20 Networking and Farewell Cocktail organized by the Argentine Industrial Union (UIA). The event was attended by the Argentine ministers, heads of the international organizations, G20 Sherpas, B20 members as well as business leaders from the G20 non-member countries. 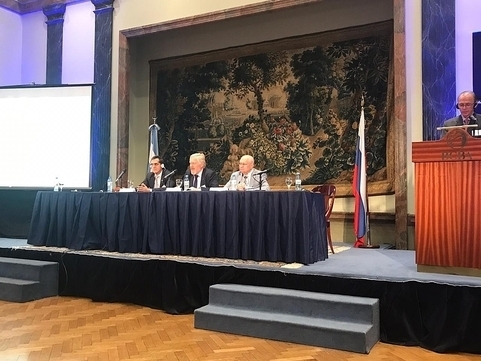 On 29 November 2018, Victor Cherepov addressed the plenary session “Perspectives and difficulties in Russia-Argentina relationships” at the Forum of Councils of Entrepreneurs of Russia and Argentina. Victor Cherepov highlighted achievements and opportunities in Russian and Argentinian companies` cooperation at the multilateral dialogue platforms, including the Business 20, WTO Trade Dialogues, Business at OECD (BIAC) and RSPP and UIA`s contribution to this work. Victor Cherepov congratulated the Argentinian partners with a successful presidency in the G20 and B20. He noted some of the key achievements of the presidency including the adoption by the ministers responsible for the digital economy “G20 Digital Government Principles”, “Bridging the Digital Gender Divide – Delivering Impact” and “Accelerating Digital Infrastructure for Development” documents; agreement to implement comprehensive strategies on addressing antimicrobial resistance; as well as proposals on the future labour markets aimed at mitigating skills obsolescence in the context of economy digitalization, in particular by providing lifelong learning as well as addressing informal employment. Victor Cherepov expressed a hope that all these decisions will be included in the final communiques of the G20 leaders Buenos Aires summit on 30 November – 1 December 2018. Mr. Cherepov emphasized that this year the RSPP and the Argentinian B20 presidency held a successful B20 Regional Consultation Forum in the framework of the St. Petersburg International Economic Forum (SPIEF) with attendance of Deputy Prime Minister of the Russian Federation Mr. Maxim Akimov and invited all participants to visit the B20 Forum next year to be held in St. Petersburg on 6 June 2019. In conclusion, Mr. Cherepov said that the integration groupings of which Russia and Argentina are members, - the Eurasian Economic Union (EAEU) and MERCOSUR develop their cooperation and this work should draw on the interests of businesses of our countries and engage business associations.